I've finally had some time to sit down and start writing down my favorites. Besides lipsticks, I also have a million eye products and so it was pretty hard for me to narrow down what I loved during 2017. I didn't include some all time favorites like the Charlotte Tilbury Color Chameleon Color Morphing Eyeshadow Pencils or the Marc Jacobs Beauty Highliner Gel Eye Crayon Eyeliners, but I still have a pretty large list of products for this post. I started with one and then now I’m on the hunt to collect almost every color. I love how they’re an easy to use glitter and add so much drama and attention to your eyes without going too overboard. One of my favorite ways to use them is with a thin eyeliner brush and applied on the inner half of my lower lash line. With the more neutral colors like Kitten Karma, applying it this way creates a very sparkly but office appropriate look (or at least in my office). If I spent $130 on something and kept it, I better love it. With that being said, I do really love this palette. Sure there are dupes like the one from Colourpop which I don’t have, but I can see why people rave about the Natasha Denona formula after getting this palette. I’m a warm palette lover in general and orange shades are my jam so there’s not much to not love in this palette. 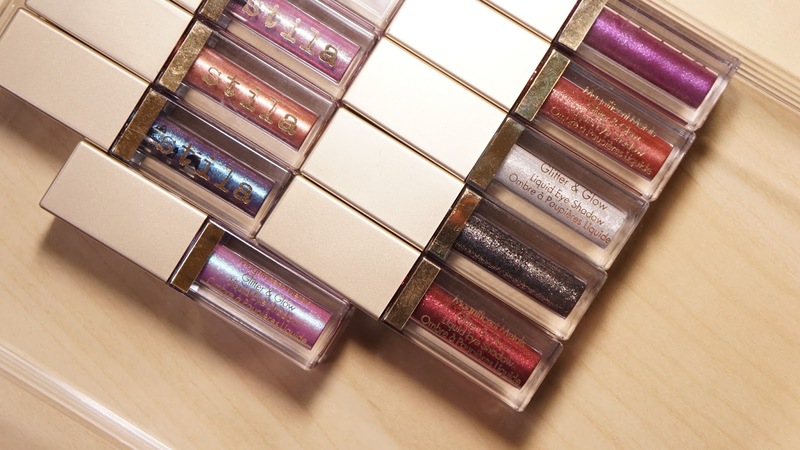 The metallic/shimmery shades are so smooth and pigmented, but it can sometimes lead to fall out. I prefer using my fingers in general for shimmery shades though and so I only have fall out problems when I’m using fluffier brushes. The mattes are also really pigmented and easy to blend. I've used every shade from this palette and that's also pretty rare for me especially considering how many shades there are in this palette. Mandarine is one of my favorite shades ever and it's a super gorgeous vibrant metallic yellow orange shade. I’ve very rarely hit pan on an eyeshadow since I have so many, but I hit pan on Melt Cosmetics Eyeshadow in Rubbish. It’s a mustard color that became my new favorite crease color ever since I got it. 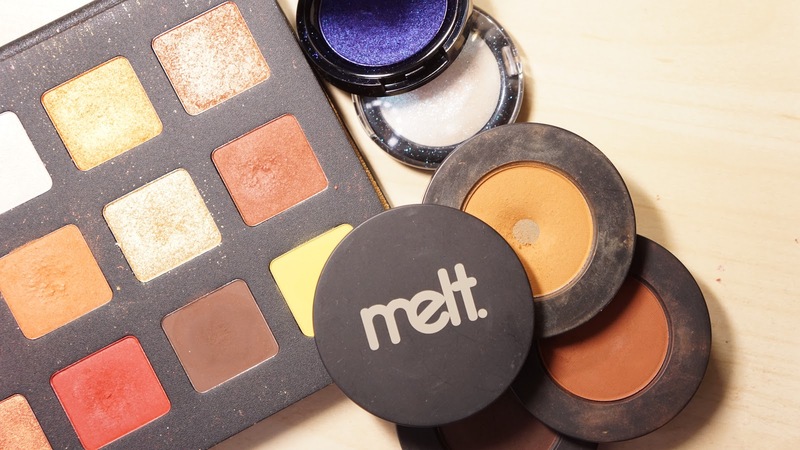 I’ve found that most Melt Cosmetics matte shadows are a bit more on the powdery side and so the powder doesn’t always stick onto the brush. 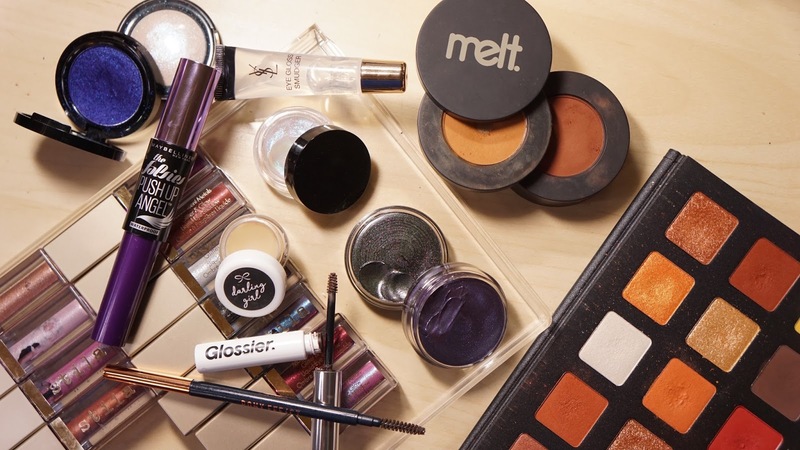 Rust is an amazing "palette" in general and I've been able to create so many looks using it by itself and also with other eye products. This set was also $130 and while not everything was unique enough for that price (like the black cream base or pigment), but there were some absolute hits in it. The pigment in UltraViolet Blue is a gorgeous pigmented violet based blue pigment that’s packed with metallic goodness. Whenever I want a blue look, I go straight for this pigment. It feels soft to the touch and applies so easily with just my fingers. I also adore the Pigment in Astral White and Eye Gloss in Cyber (mentioned below) from this set. Astral White reminds me of Sugarpill's Loose Eyeshadow in Lumi, but with a stronger blue shimmer and is jam packed with the light blue super sparkly duochrome and white base. It's not as soft as UltraViolet Blue, but I just apply a tackier base to make it shine even more. Most eyeshadow primers work about the same way on me especially since I always set them with a thin dusting of translucent powder. When I’m wearing more metallic or shimmery shades, I like to use the Darling Girl Cosmetics Primped and Primed Eyeshadow Base to minimize fall out and really bump up the color and finish. 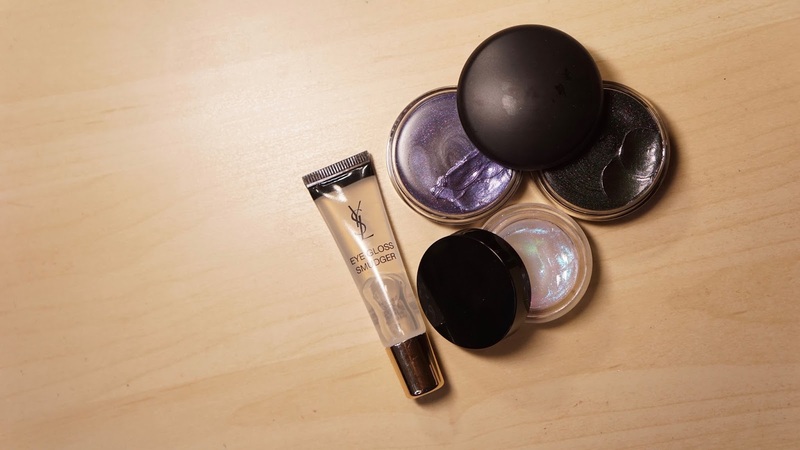 While I also have their Glitter Glue, the Eyeshadow Base is easier to use since it’s in a pot which can be thinly applied using your fingers. When the L’Oréal Telescopic mascara was discontinued, it left a hole in my collection because it had the most perfect wand for my thin and short lashes. The wand was made out of short plastic bristles that was arranged like a comb on both sides. The Falsies Push Up Angel Mascara’s wand is pretty similar except the bristles are on one side. I’m not that picky about formulas, but they need to be waterproof since only waterproof formulas keep my curl. In general, I love fluffy brows and Boy Brow is my favorite product to use to achieve that look. On most days, I just brush this product through my brows and I'm done! When I want more definition, I use the Sharping Brow Definer to sharpen up the tail of my brows. I've repurchased both products multiple times and don't see myself using anything else. 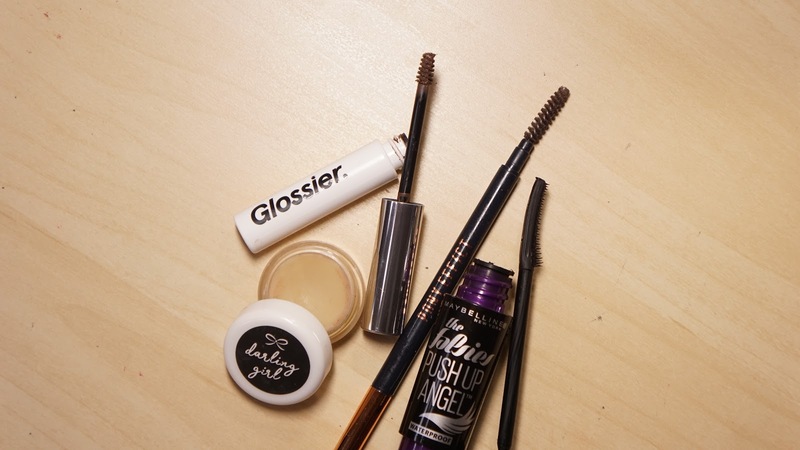 And that's it for the eye & brow favorites! Have you tried any of these products? What eye and brow products did you love during 2017?